The Flash Memory (1-2TB usable capacity) is arrayed in nine RAID-5 protected hot swappable modules. The reliability of each module is further enhanced with ECC memory layouts, wear-leveling, and bad-block retirement. The RamSan-500 uses NAND-SLC flash memory, the highest quality of flash memory available on the market. The RamSan-500 is designed from the ground-up to protect data from the problems inherent to traditional flash storage. The enterprise storage game just changed today. "Power of a SAN in the palm of your hand"
If FusionIO is for real, enterprise storage has just shifted gears. While storage vendors have been focusing on larger disk based systems with all the fancy features, it appears that out of nowhere a new storage solution was born today. A new flash storage card could make huge storage area networks go the way of the floppy disk. The company’s ‘ioDrive’ combines hundreds of gigabytes of flash storage onto a small computer card and company officials claim that the tiny card could replace banks of hard drives. The card will initially have 80-640 GB of NAND flash on ONE PCI card and will scale up to 1.2 TB by the end of next year. Performance? Remember when you moved from floppy to a hard drive? 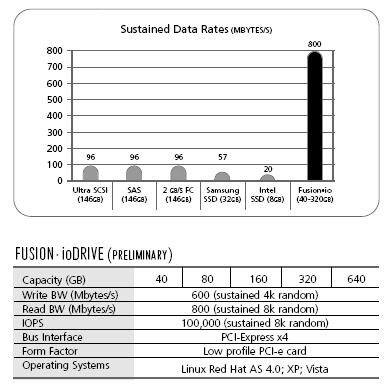 FusionIO is taking us to the next level of performance just like the hard drive did when it replaced the floppy disk. ESX Server 3i is the industry’s first hardware-integrated hypervisor built on a next-generation thin architecture, giving your organization an efficient foundation for building a dynamic, automated data center. Storage Vmotion gives the admin the ability to move the backend storage of a VM without taking the virtual machine down. It's still unclear exactly how this will be implemented, but basically the vmdk files will be copied to a new location then vmware will automagically swap to the new files. If you have a VM that needs faster disks, SVmotion it! Site Recovery Manager will allow the admin to control how a system fails over to another site. The backend storage will do the syncing of the data, and virtual center will allow the control of switching to the new site. Business Recovery predefied! Nice! I'm not a writer or pretent to be one that has a grasp on the english language. (see my point yet?) But I do have ideas and i hope someone someday might find them here. Vmware started an revolution in enterprise computing. Not since the beginning of the IBM PC in 1982 has such a product stired so many business roots..
What a better way to start a new blog but on the eve of the next generation of enterprise computing. VMworld! VMworld 2007 starts tomorrow and with all the posting online, I thought I would put my 2 cent into the pot. My goal is to track all aspects of enterprise virtualization. Wish me luck.